Positioned right on the edge of the Karijini National Park, the Auski Roadhouse is in the important position for those travelling north. Home to good food, good beer and a warm hospitality, this is one not to miss. Offering a pleasant break on the road from Broome to Port Headland, the Pardoo Roadhouse is set on a spacious, shaded property and boasts a tavern, licensed restaurant, swimming pool and souvenir shop. Providing a rest stop for the barren 600 kilometre stretch between Broome and Port Headland, Sandfire Roadhouse is also a great base if you are wishing to explore the famous Eighty Mile Beach. The Roebuck Plains Roadhouse is a fantastic place to stop by when in the Roebuck area. Offering friendly service, great food and cold drinks, this is the perfect spot to refuel and prepare for the trek ahead. This is Australia's most visited meteorological station, with the crowds flocking when the balloon gets released twice daily. Tours are available, but to avoid disappointment ring up before hand to let them know you are coming. Relax by the river when you stop in at the Willare Bridge Roadhouse or marvel at the distances you have travelled, displayed on wooden planks at the entrance of the roadhouse. Refuel and stock up on supplies, all while taking in the unique surroundings. The Billabong Roadhouse is one of the westernmost localities in Australia and is a must to stop at while driving in this area. Open 7 days a week, from 7am to mid-evening, Balladonia is populated by about 9 people, depending if you are staying or going. It is an important rest stop while travelling across the Nullarbor so be sure to add it to your itinerary. 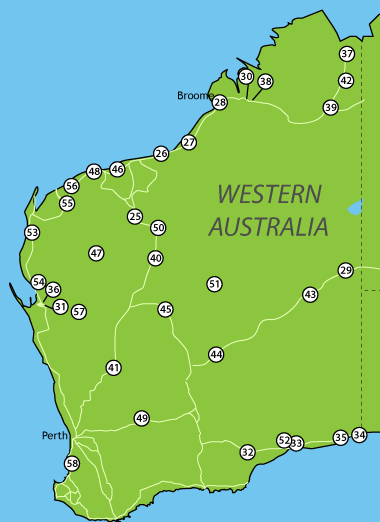 Cocklebiddy provides the Nullarbor traveller with the usual array of take-away foods, a licensed restaurant and a bar with a pool table, along with useful (and often welcome) accommodation facilities. Boasting a unique and extensive history, Eucla is buzzing with activity and is an exciting place to stop in on your journey. The roadhouse is part of the Eucla Motor Inn Complex and offers great food and hospitality. Although the Mundarbilla Roadhouse is great in itself to stop at, the bar that sits out the front of it is probably the establishment's best draw card. Possibly the snuggest bar in the Nullarbor, this bar is perfect for a round of pool and relaxing with an icy cold beer. Situated right near the ocean, the Overlander Roadhouse is a fantastic place to visit if you are looking for somewhere to base yourself while visiting Monkey Mia. Offering great food and every sort of knick knack you could think of, the Doon Doon Roadhouse is a must to experience this remarkable part of the outback. The Mt Barnett Roadhouse is situated just off the Gibb River Road and acts as the perfect base for exploration of the sensational Manning Gorge. It is also a useful site to refuel, restock and prepare for the road ahead. Stop and relax a little at the Poinciana Roadhouse, where you will find a friendly cafe atmosphere and ample amounts of fuel to fill up and prepare for the road ahead. Hosts, Bob and Joan Currie, will welcome you with open arms and invite you to share their great little roadhouse. Stay the night and enjoy a home cooked meal or simply relax with a nice cold drink at the end of a long, hot day of travelling. Paynes Find is supposed to be an amazing place to see wild flowers, so if this is your thing you should definitely stop in at the local roadhouse to find out where the wildflower hot spots are. Owned by the local community, Warmun Roadhouse will be a sight for sore eyes, offering all the comforts the harsh outback lacks. Relax by the swimming pool or in the comfortable indoor dining area, where you will be greeted with friendly service and a pleasant outback cheer. Discover the traditional ways of the Aboriginal people when you visit the Warburton Roadhouse. Offering all the supplies you will need to re-stock, this is a must while on the travelling along the Outback Way. Regarded as 'The most isolated roadhouse in Australia', this roadhouse derives its name from the Tjukayirla Rockholes which are situated near by. Dingoes, emus, kangaroos and camels flock here, so follow the lead and join them. Wiluna is a township that was formed during Australia's Gold Rush, so be sure to drop by the local roadhouse for a truly golden experience. Offering a restaurant open for breakfast, lunch and dinner, the Whim Creek Roadhouse will be a welcome sight for hungry mouths and empty fuel tanks. Mt Augustus is a truly remarkable place to visit and you can look forward to seeing some fantastic Aboriginal painting, along with the opportunity to climb the world's largest rock. Stop in at the local roadhouse to pick up some refreshments before the hike; you will need them. Karratha is a rather famous mining town and the history of this industry still lives on here. It is also relatively close to the Milstream-Chichester National Park, making it a must to base yourself for exploration of this beautiful natural area. Stock up on fuel, food and supplies at the Bodallin Roadhouse before you continue our trek along the Great Western Highway. Incorporating a tavern, motel, restaurant, Caravan Park and fuel distribution network, this roadhouse has it all. This roadhouse is open 7 days a week, from 8am until 6pm, offering cash sales only, so come prepared. The Caiguna Roadhouse is one of the three Nullabor roadhouses that provide a 24-hour, 7 days a week service. Offering a range of takeaway foods and snacks, a public telephone and pay showers, this is the perfect place to freshen up before the long road ahead. Offering fuel and mechanical repairs, this is one roadhouse you will be happy to see in times of trouble. Nestled just off the Wooramel River, this roadhouse is situated just 58 kilometres before Monkey Mia, making it the perfect spot to stop and prepare for your adventure here. Positioned near the Ashburton River, the Nanutarra Roadhouse is a great spot to stop for a can of coke and a packet of chips, but that's pretty much it. The Fortescue River is a fantastic place to take a dip and cool off, finishing your time here with an icy cold drink from the roadhouse, served by friendly and smiling staff. The Murchison Roadside provides essentials like fuel, fast food and basic groceries, along with traditional outback accommodation. Offering all the facilities you need for a stop-over while travelling, this roadhouse is sure to please.